Triethyl phosphate TEP manufacturer price - ZhangJia Gang YaRui Chemical Co., Ltd.
Triethyl phosphate TEP belongs to the phosphate ester flame retardant, also called phosphoric acid ethyl ester three TEP, used in rubber and plastic plasticizer, also used as raw materials for preparing pesticides. And as the ethylization reagent, for ketene production. Triethyl phosphate TEP manufacturers prices are more distributed in the Jiangsu area, the factory general plant less 3000 tons / year, 6000 tons / year production of energy. In the world of Triethyl phosphate TEP application market 1, maximum USA, Asia, Europe 2, most leading representative, in the Japanese market, in Japan, the product of 70% catalyst for about 20%, used as a solvent. 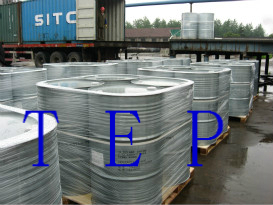 Our company produce Triethyl phosphate TEP for exports, main export market: America, Asia, Europe and other countries, our company is one of the production of Triethyl phosphate TEP export manufacturers, monthly production of 200 tons / month, the proportion of sales: 60%, 40% domestic and foreign. The above is the product description, such as the further understanding of the Triethyl phosphate TEP manufacturers price required, please contact us. If Triethyl phosphate TEP manufacturer price product is not what you want, we can be customized according to your needs, please send us your order to Email: sales@yaruichem.com , or click here to post your buying lead.